You need some time for you: time to unwind, to re-energize, and to just be. 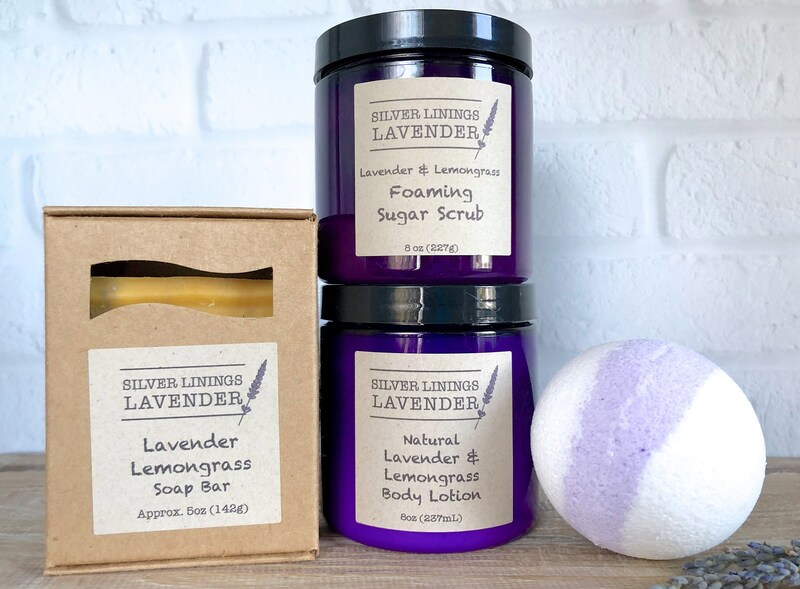 So set aside the mountain of tasks on your “to-do” list, draw yourself a hot, steamy bath, and give yourself the incredible indulgence you deserve with this uplifting Lavender Lemongrass self-care set from Silver Linings Lavender. Pure essential oils of lavender, lemongrass and rosemary come together in this splendid set to help you create the perfect refreshing, yet relaxing, self-care experience. Our generously sized bath-bomb will turn your ordinary tub into a superior, spa-worthy soak. Its luxurious blend of natural skin-smoothing oils and rich goat’s milk will leave your skin buttery soft, while its fresh and spirited aroma effervesces the tension from your body and mind. 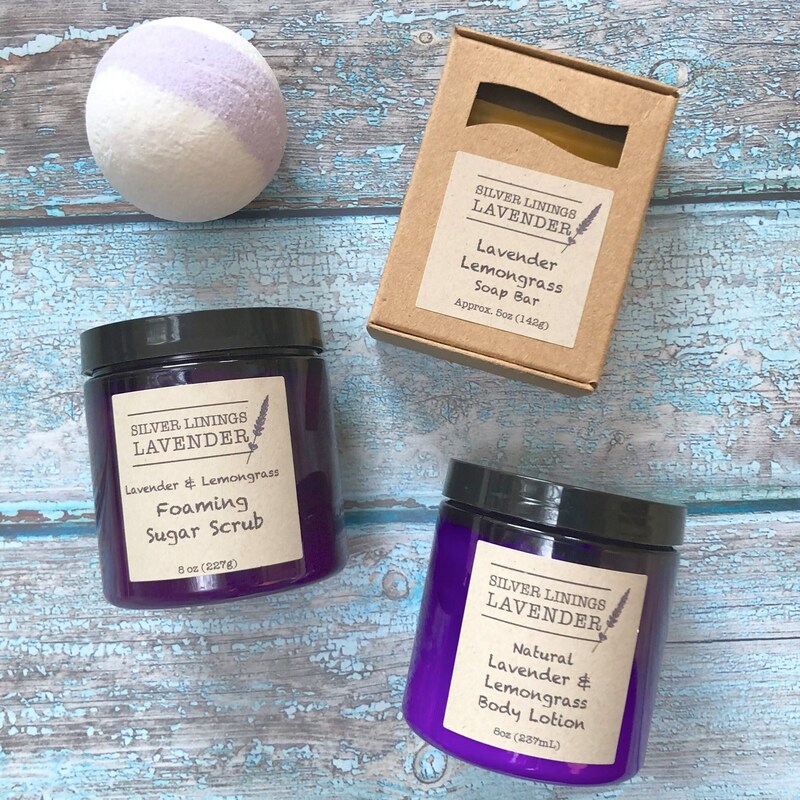 And because this set is all about the pampering you deserve, we’ve added our Lavender and Lemongrass Foaming Sugar Scrub to ensure an elating experience. Its gentle exfoliation will stimulate blood flow, and whisk away dead skin cells and rough patches; leaving behind the soft and silky-smooth skin of your dreams. Your Lavender Lemongrass Soap Bar will be waiting to take center stage when you need it most: on those days when you just can’t find the time for a long, luxurious bath. Even a ten minute shower can become a rejuvenating moment of reflection when you’ve got the incredible lather and all-natural ingredients found only from Silver Linings Lavender. Finish your self-care session with our Natural Lavender & Lemongrass Body Lotion. You’ll adore the way it melts effortless into your skin; leaving it supple, radiant, and locking in the moisture it craves. Give yourself or someone you love the gift of self-care they deserve with our Lavender Lemongrass Gift Set, and say “hello” to falling in love with your bath again. I am continually impressed by everything I get from SLL Farm. The lavender and lemongrass set is incredible! The smell is indescribable! I bought the set as a Christmas gift for myself and I am in love. The lotion is so thick and luscious that it only takes a little bit to do the trick. The bath bomb was heavenly and so relaxing. And the scent alone of the soap bar is to die for. I am a lifetime customer!